Irrigation water block is no guarantee for Basin by Tom Mallams Klamath County Commissioner for Herald and News 12/16/14. "In the Dec. 13 Herald and News, I was incorrectly quoted as saying there is a “guaranteed” block of water for Project irrigators in the proposed water agreements. I have never said this. I have consistently said they only “claim” or “attempt” to have a guaranteed block of water for Project irrigators..."
Water pact failure results from history of bad choices, by Maudie Smith, Klamath Falls, letter to H&N 12/14/14. "I believe we’ve gotten to this point because of a long-term effort to secure tribal funding at the expense of agriculture..."
Letter from Klamath Falls City Councilman Bill Adams to Congressman Walden, Senator Jeff Merkley and Senator Ron Wyden, posted to KBC 12/16/14. "...While their is mixed support by members of our agricultural community, I believe it is only because they have their backs against the wall. The majority of this community does not support this bill because it requires Dam Removal. This was shown by the election of all three County Commissioners who have opposed the KBRA and recently sent you a letter opposing SB2379..."
More water needs to be allocated for agriculture, by Brandon Criss, Siskiyou County Supervisor District 1, posted to KBC 12/7/14. "Eighty percent of Siskiyou County and 77 percent of the Tulelake basin voted no on dam removal. When dams are a Klamath County campaign issue, pro-dam candidates have consistently won. With the dams in place, we are seeing record runs of Klamath River salmon. Tearing out existing hydropower dams that have proven benefits for fish, Basin agriculture, and this past summer’s firefighting efforts, is no solution." Controversy means new water pact is necessary, Herald and News letter to the editor by Wilma Heiney, Tulelake, posted to KBC 11/30/14. More than 60 people packed into the 11/21/14 Klamath County Commissioners public meeting to discuss sending a joint letter with Siskiyou County Commissioners to Congress in opposition to the Klamath settlement agreements. Many opposing the Commissioners' letter criticized the elected officials for opposing the agreements that they were elected to oppose. Several speakers supported the Commissioners. The Klamath Tribes threatened to shut off water to irrigators again if the KBRA did not materialize. After public comment, when it became apparent the Commissioners were going to mail their letter regardless of the criticism and insults, most of the opponents stomped out while the Commissioners were explaining their stance and possible alternative solutions that seemed valid to the Klamath and Siskiyou elected officials and the constituents who elected them. Herald and News articles concerning Klamath County Commissioners meeting to send joint letter with Siskiyou County elected officials to oppose the controversial KBRA dam removal agreement. H&N 11/22-23/2014. 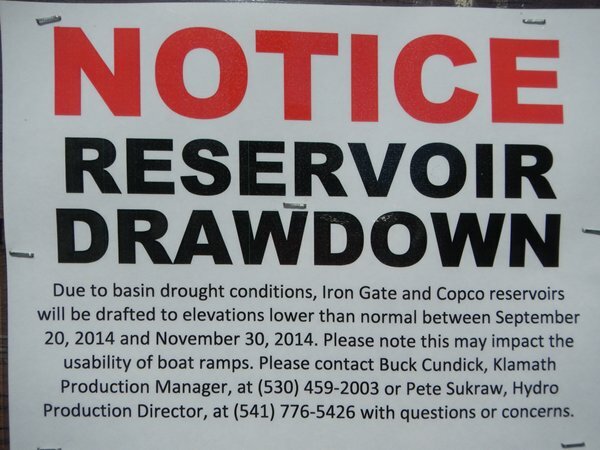 Questions about Basin water issues continue, H&N letter by Karen Walther, posted to KBC 11/16/14. "I suggest you Google Agenda 21. See how far it has progressed in our Basin. Do you really want this to happen? If you do, then continue fighting for the Klamath Basin Restoration Agreement and the like." Water is a precious resource in the Basin, H&N letter to editor by Harvey Houston, Klamath Falls, posted to KBC 6/19/14. "In Southern California, the river waters were so low, they had to build dams to keep out the ocean water. Officials are thinking of building more dams on the Sacramento and San Joaquin rivers. Our Oregon officials want to remove the dams on the Klamath River." County taxpayers deserve more input in irrigation agreements, H&N letter by David Hurst, posted to KBC 4/25/14. "The upper Basin ranchers and farmers are not given a lot of choices in any of the agreements. The tribe had to vote on the agreement: Why doesn’t the taxpayer have the same choice?" Siskiyou County Supervisor Brandon Criss' Newsletter, posted to KBC 4/22/14. "...a list of the broad sector of support for saving the Klamath River Dams, including county and local governments, non-profits, agricultural organizations, and the nearly 80% vote of the people of Siskiyou County. It was important to...counter the other side’s false rhetoric that the Klamath Basin supports dam removal."